Most people who really like cooking also enjoy going to the market and picking out those perfect ingredients for their next kitchen masterpiece. Not me, no way! I have become the queen of creating new dishes while avoiding that trip to the grocery store. I would much rather reach deep into the back of my cupboards or refrigerator to see if there is anything out there just waiting to be found and thrown into the pot! This particular chicken dish was a creation in just that circumstance. 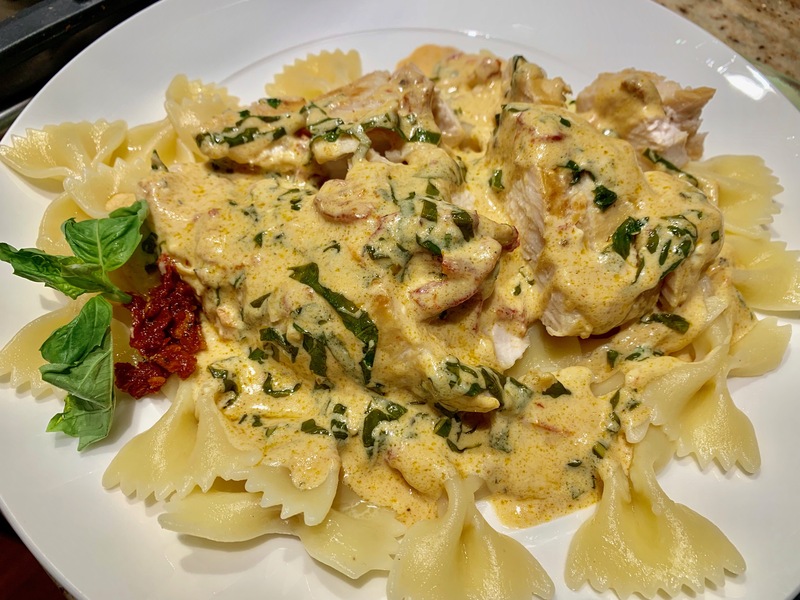 Yes, it is chicken in a light cream sauce flavored with sundried tomatoes and fresh organic basil. Placed over bowtie pasta and then garnished makes it look so appetizing! pour sauce over pasta and garnish with sundried tomato and fresh basil leaf. Looks delicious !!! Can’t wait to try this!